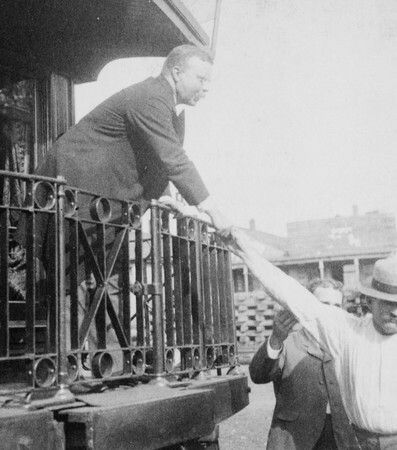 On June 18, 1910 former president Theodore Roosevelt returned to America in New York, New York, after a year’s long African safari. He had departed from Southampton, England earlier that week on June 10, concluding his brief tour of Europe. Telegram communication allowed for newspapers to publish the daily progress of his journey. A particularly jubilant headline from the Boston Daily Globe (now the Boston Globe) captured America’s anticipation for the return of the former president, it read, “ROOSEVELT IS COMING HOME, HOORAY!” The article detailed Roosevelt’s activities on the Kaiserin Auguste Victoria and what he planned to do once he arrived home. Upon his arrival a reception of almost 100,000 people, including several members of his family, awaited him. Once on shore, amidst the cheers, reunions, and songs, Roosevelt made it a priority to greet the members of the press. Receiving them like he would an old friend, Roosevelt shook their hands in turn and exclaimed “Boys, I am glad to see you. It does me good to see you boys. I am glad to be back.” Amidst the crowd one reporter could be heard shouting “We’re mighty glad to have you back!” Over a year after his presidency, the press still covered him as if he had never left office. Interactions like the one on June 18, 1910 were not uncommon between Roosevelt and journalists. Not since Abraham Lincoln had a president so effectively harnessed the press’s capability to motivate action among the American citizenry. 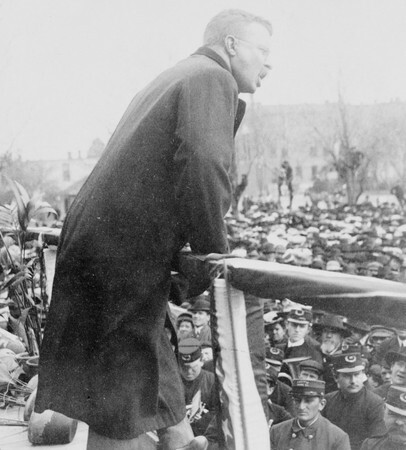 Seeking to minimize corruption, stifle rising inequality, and relieve a middle class under crushing weight from industrialization, Teddy would have to mobilize Congress to act. With a Republican party that was dominated by a devotion for laissez-faire economics and reactionary policies, he knew early on in his presidency that he would have to make a direct appeal to the people. In order to educate the masses on his policies, he formed a relationship with reporters from a variety of newspapers and magazines. He would also seek to project himself as a moral leader, diligently advocating for political participation by the people. His incredible life and influence on the relationship between president and press are still present even in today’s digitized world. Once Theodore Roosevelt entered the White House there were over 2,225 newspapers in America and with more papers came the need for more stories. He received the oath of office on September 14, 1901, going into the office with mixed feelings of excitement and dread. He feared his presidency would be perceived as a successor position to that of William McKinley, who had died from an assassin’s bullet. Though he swore to continue the policies of McKinley, he would only stick to the course laid out by his predecessor for the first year. On his first day in office Roosevelt held a meeting with managers from the Associated Press, Scripps-McRae Press Association, and the New York Sun. It was here that Roosevelt made his intentions clear; he would allow reporters unprecedented access to himself and the daily workings of the White House so long as they followed a specific set of parameters set by him. He would disavow any information in stories printed without his permission and would deny those reports access indefinitely. So, began Roosevelt’s long, sometimes troubled, relationship with the press. Teddy himself was a skilled writer, contributing some important texts to navy and military history. His admiration for writers lead some to call his relationship with the press “collegial”. In 1902, as the West Wing was undergoing renovations, Roosevelt would become the first president to give members of the press their own room in the White House. The room would have telephone lines ensuring White House reporters could get any story out into the public before other reporters even had a chance to cover it. Though the same room is no longer used today, this created a lasting legacy on the coverage future presidents would receive by establishing the first White House press corps. In multiple legislative battles, Teddy proved every time that he was not afraid to deploy the full powers of the press. He did this in order to put lawmakers under the gun and align themselves with polices he saw as furthering the Progressive movement. One such instance came upon the release of the novel The Jungle by Upton Sinclair on May 25th, 1906. The novel wrote on the revolting inner workings of the meat industry. The pages inside contained the grisly details of rotten meat, animal entrails, and diseased animals. Roosevelt was no fan of Sinclair and his socialist tendencies, but he was disturbed by the allegations in the novel. He appointed two investigators, Charles Neill and James Bronson Reynolds, who would later confirm the allegations in The Jungle, penning the Neill-Reynolds report. Representative James Wadsworth (R-NewYork) chairman of the House Agricultural Committee, along with two Chicago congressmen expressed concern over any proposed legislation. Their chief concern was that any bill requiring inspection would pass the increased cost of regulation onto the consumer. Roosevelt was beside himself with disbelief. If the Neill-Reynolds report was to surface it would do irreparable damage to consumers and meat exports. He precariously hung the possibility over their heads. Roosevelt commanded an army of reporters that could break the findings in the Neill Reynolds report at a moment’s notice, possibly destroying the reputations of those who refused to act. After a month-long showdown in the House, Roosevelts strategy had worked with the passage of the Pure Food and Drug bill on June 30, 1906; the vote totaled 240 to 17. Roosevelt’s unique relationship with the press did not last the entirety of his term. Though it cannot be said that all reports would receive Roosevelt coldly, or turn their backs to him completely, one speech frayed the friendships he had built with some of his most trusted reporters. A reporter for McClure’s magazine, Lincoln Steffens, had written a piece in March 1906 speculating new parties would soon arise as a result of the Progressive movement. Roosevelt was struggling to keep his own Republican party together, and baseless inferences from journalists did not help. Roosevelt was becoming disenchanted with the new wave of detail oriented, investigative reporters that now dominated the newspaper industry. On April 14th, 1906, three months before the showdown over meatpacking regulations in the House, Roosevelt gave a speech at the White House warning of the dangers of sensationalized reporting. A headline from the Boston Daily Globe read “SANITY NEEDED AS WELL AS HONESTY”. During the speech Roosevelt was quoted saying, “To assault the great and admitted evils of our political and industrial life with such crude and sweeping generalizations as to include decent men in the general condemnation means the searing of the public conscious”. At the time of Roosevelt’s last meeting with the White House press corps he had left them with a final prediction that now almost feels like a warning. Teddy claimed, “There will be someone at the White House you like more than me but not one who will interest you more”. The office of the presidency has seen eighteen occupants since Theodore Roosevelt. Despite the most valiant of efforts, almost all have tried in vain to wield the same grip on public opinion that Teddy grabbed with both hands. Research conducted by the National Opinion Research Center further solidifies this point. By compiling public opinion surveys for 1935 to 1980 and matching them with president’s policy goals and media coverage, the researches wanted to find if any president has been able to sway public opinion in a significant way. The results showed little evidence that demonstrated a president’s effect on public opinion. The only president that was shown to have significant sway of public opinion was Theodore’s cousin, Franklin D. Roosevelt. This analysis holds true even in C-Span’s Survey of Presidential Leadership where Franklin barely beats out Theodore for 1st place in the category of Public Persuasion. In spite of Teddy’s deteriorated relationship with the press nearing the end of his term, the media still remembers him as an icon of progress, intelligence, and endless intrigue. Whether it was his many hunting expeditions, his time as a cowboy in the Dakotas, or his unflagging push for progressive policies to reign in out of control business tycoons, Theodore Roosevelt knew how to dominate the headlines. Journalists still remember Theodore today as they would have remembered him in 1901. He was one of them; a writer himself, and an admirer of writers. An article from the Washington Post published in January 2018 titled “Trump isn’t Big on Reading. 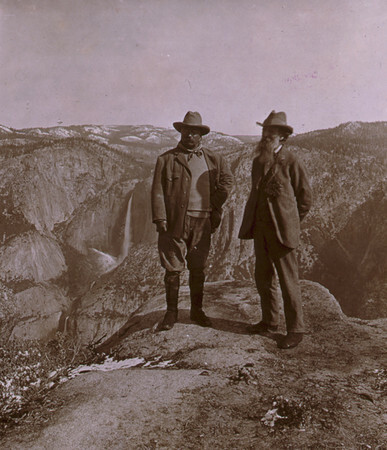 Teddy Roosevelt Consumed Whole Books before Breakfast” details the constant flow of literature he would devour. 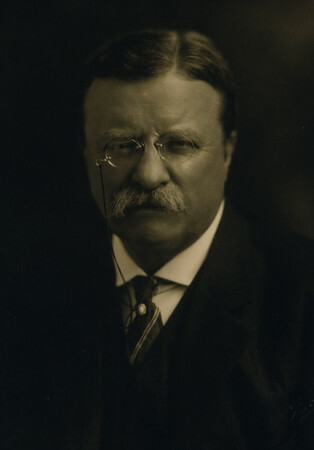 The article claims Teddy would read through newspapers and magazines in an almost “predatory” way, tearing out the pages once he was finished with them. Not even his closest friends in the journalism community were above his scrutiny. The impact of Theodore Roosevelt’s complete transformation of the working relationship between the president and the media is more present now than ever before. The last three presidential campaigns show that media skills are a prerequisite to winning the White House, for that you can thank Theodore Roosevelt. “ROOSEVELT IS COMING HOME, HOORAY!” The Boston Globe Archives. June 11, 1910. Goodwin, Doris Kearns. The Bully Pulpit. Simon & Schuster, 2013. Lansford, Tom. 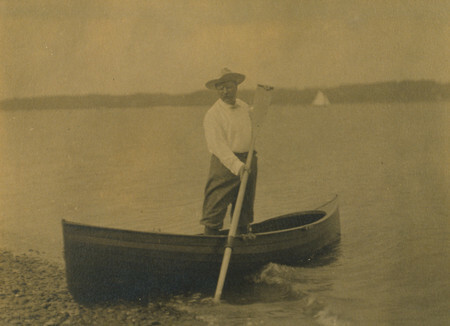 Theodore Roosevelt: A Political Life. Nova History Publications, 2004. Rosenwald, Michael S. “Trump Isn’t Big on Reading. Teddy Roosevelt Consumed Whole Books before Breakfast.” The Washington Post. January 09, 2018. Wolraich, Michael. Unreasonable Men: Theodore Roosevelt and the Republican Rebels Who Created Progressive Politics. Palgrave Macmillan, 2014.